Aloys Habimana, human rights activist, in his office. Aloys Habimana, 34, is a leader of LIPRODHOR, the only Rwandan human rights group considered independent of the government. 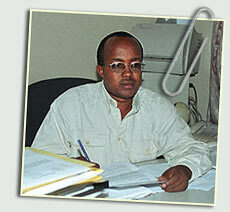 Habimana has monitored the Rwandan court system since 1997. We cannot really be hostages of our past. We have to move forward, and we can't really move forward when we still have 100,000 people in prison, when we have thousands and thousands of orphans and widows who are still thirsty for justice. We can't move forward while we know that what happened may be repeated tomorrow. Gacaca is complex. People need to understand why they should really participate, because this is after all a participatory process. If you don't manage to convince the population that it should participate, then it's really hard for gacaca to succeed. There are some factors that do not really favor this participation. We have a postgenocide society where division is really deep among the population; where people may not have the same understanding of things; where tensions are still visible; where people still have wounds in their hearts and need to be healed; where trauma seems to be everywhere. When we talk about issues such as reconciliation, there is one precondition that must be met to just say that we have made one step, and this is truth telling. There are a lot of things that remain hidden about the genocide. Victims need to know in which circumstances their relatives were killed, and of course those that killed them need to acknowledge what they did and if possible, ask for forgiveness. Rwanda as a country needs to know about what happened during the genocide, who planned the genocide and who executed it -- and, of course, to go beyond that stage and really understand why people took machetes and went against others. This is necessary to be sure that in the future the same atrocities are not repeated. I don't believe that any form of justice can solve (all) the problems faced by postgenocide societies. There must be other measures taken, because justice doesn't solve everything. But the first step is telling what happened and why, because this can promote understanding. The gacaca process at least can be a good opportunity to put together what happened and why, and of course it provides space for discussing these issues in a way not any other form of justice can do. The ball is now in the court of our leadership and of our civil society. Civil society is very weak, it is traumatized itself -- and the leadership we have doesn't want to facilitate its (expansion). Sometimes I get discouraged, I feel desperate, and think that maybe it will take a very long time for this country to recover. But when you do work like what we are doing here, if you lose hope, you cannot really work. There is one proverb that says: "The night might be long, but whether you want it or not, the day will announce itself." So we have to work for this night to be as short as possible. That's all we can do.